Yesterday afternoon was a reminder of how great it is to live in Southeast Portland -- the center of the universe. 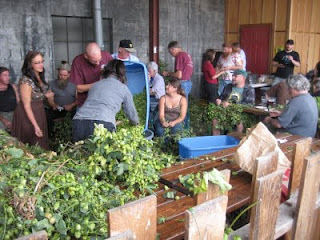 An assortment of beer lovers came out to help the Lucky Lab pick fresh hop cones off of donated vines, for inclusion in the Lab's fresh-hop seasonal, The Mutt. I had a blast the short time I was able to participate last year, so I scheduled a little extra time to hang out this year.